Stop searching for the perfect email marketing tool. Make your email marketing process easier, simpler & analytical with Flack Automatic Email Sender. Allow Flack to expand & grow your business with its detailed reporting. Buy Now! A Sneak-Peak Inside The Flack Automatic Email Sender! 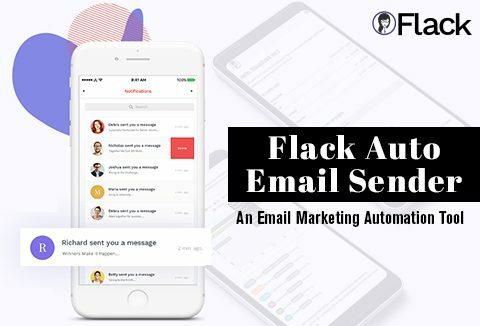 Discover All The Superb Features Of Flack Automatic Email Sender! Flack is considered a publicity agent for email marketing that you should always trust in terms of enhancing your business. Flack’s features are considered to be powerful enough to work for all. The Flack automatic email sender helps your business grow due to its advanced features of reporting. You can always access it anywhere you are. Based on the plan selected, you will get a license key and License key to activate your account. Improve your campaign results by using the Flack Automatic Email Sender. At A Deal Price Of $29 Annually. I have been looking for a solution for my newsletters for a long time, normally its always an expensive proposition. I searched all possible platform for the better deal. I finally found this app on dealfuel, that has solved my problem. Easy to use, efficient. It’s my new “soft to go” when I need to do emailing campaigns. Great deal ! The tool is ok. Lacking zapier integration or at least webhooks. You need a programmer to connect other tools via api. So testing and basic research has to be done. Finally a tool with a lot of options, but no documentation. Best deal I’ve ever bought! unlimited everything (emails, subscribers, list, etc), It made me save a lot of money and works very well. I configured this in minutes and started using it. Essentially Flack gives me the same features that most of expensive autoresponders software has, for just one-lifetime payment. good and easy to use. need to spend time figuring out. I like that it provides an API.